Clarissa "Clara" Harlowe Barton (December 25, 1821 – April 12, 1912) was a pioneering nurse who founded the American Red Cross. She was a hospital nurse in the American Civil War, a teacher, and patent clerk. Barton is noteworthy for doing humanitarian work at a time when relatively few women worked outside the home. She had a relationship with John J. Elwell, but never married. 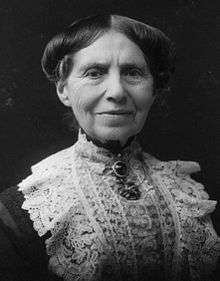 Clara Barton was born on December 25, 1821 in North Oxford, Massachusetts. Barton's father was Captain Stephen Barton, a member of the local militia and a selectman. Barton's mother was Sarah Stone Barton. When she was three years old, Clara Barton was sent to school with her brother Stephen, where she excelled in reading and spelling. At school, she became close friends with Nancy Fitts; she is the only known friend Clara Barton had as a child due to her extreme timidity. Her parents tried to help cure her shyness by sending her to Col. Stones High School, but their strategy turned out to be a disaster. Clara became more timid and depressed and would not eat. She was removed from the school and brought back home to regain her health. Upon her return, her family relocated in order to help a family member: a paternal cousin of Clara's had died and left his wife with four children and a farm. The house that the Barton family was to live in needed to be painted and repaired. Clara was persistent in offering assistance, much to the gratitude of her family. After the work was done, Clara was at a loss because she had nothing else to help with, in order to not feel like a burden to her family. She began to play with her male cousins, and to their surprise, she was good at keeping up with such activities as horseback riding. It was not until after she had injured herself that Clara's mother began to question her playing with the boys. Clara's mother decided she should focus on more feminine skills. She invited one of Clara's female cousins over to help develop her femininity. From her cousin, she gained proper social skills as well. To assist Clara with overcoming her shyness, her parents persuaded her to become a schoolteacher. She achieved her first teacher's certificate in 1839, at only seventeen years old. This profession interested Barton greatly and helped motivate her; she ended up conducting an effective redistricting campaign that allowed the children of workers to receive an education. Successful projects such as this gave Clara the confidence needed when she demanded equal pay for teaching. 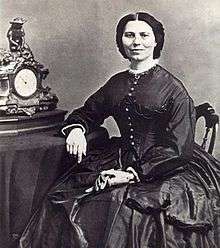 Clara Barton became an educator in 1838 for 12 years in schools in Canada and West Georgia. Barton fared well as a teacher and knew how to handle rambunctious children, particularly the boys, since as a child she enjoyed her male cousins' and brothers' company. She learned how to act like them, making it easier for her to relate to and control the boys in her classroom since they respected her. In 1850, Barton decided to further her education by pursuing writing and languages at the Clinton Liberal Institute in New York. In 1852, Clara Barton was contracted to open a free school in Bordentown. She was successful, and after a year she had hired another woman to help teach over 600 pupils. Both women were making $250 a year. This accomplishment compelled the town to raise nearly $4,000 for a new school building. Once completed, though, Barton was replaced as principal by a man elected by the school board. They saw the position as head of a large institution to be unfitting for a woman. She was demoted to "female assistant" and worked in a harsh environment until she had a nervous breakdown along with other health ailments, and quit. In 1855 she moved to Washington D.C. and began work as a clerk in the US Patent Office; this was the first time a woman had received a substantial clerkship in the federal government and at a salary equal to a man's salary. Subsequently, under political opposition to women working in government offices, her position was reduced to that of copyist, and in 1856, under the administration of James Buchanan, eliminated entirely. 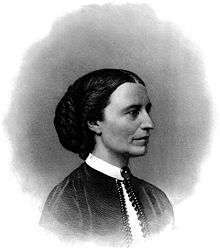 After the election of Abraham Lincoln, having lived with relatives and friends in Massachusetts for three years, she returned to the patent office in the autumn of 1861, now as temporary copyist, in the hope she could make way for more women in government service. Before her father died, Clara Barton was able to talk to him about the war effort. Her father convinced her that it was her duty as a Christian to help the soldiers. In the April following his death, Barton returned to Washington to gather medical supplies. Ladies' Aid societies helped in sending bandages, food, and clothing that would later be distributed during the Civil War. In August 1862, Barton finally gained permission from Quartermaster Daniel Rucker to work on the front lines. She gained support from other people who believed in her cause. These people became her patrons, her most supportive being Senator Henry Wilson of Massachusetts. In 1864 she was appointed by Union General Benjamin Butler as the "lady in charge" of the hospitals at the front of the Army of the James. Among her more harrowing experiences was an incident in which a bullet tore through the sleeve of her dress without striking her and killed a man to whom she was tending. She was known as the "Angel of the Battlefield." Barton achieved widespread recognition by delivering lectures around the country about her war experiences from 1865-1868. During this time she met Susan B. Anthony and began a long association with the woman's suffrage movement. She also became acquainted with Frederick Douglass and became an activist for civil rights. After her country wide tour she was both mentally and physically exhausted and under doctor's orders to go somewhere that would take her far from her current work. She closed the Missing Soldiers Office in 1868 and traveled to Europe. In 1869, during her trip to Geneva, Switzerland, Barton was introduced to the Red Cross and Dr. Appia; who later would invite her to be the representative for the American branch of the Red Cross and even help her find financial beneficiaries for the start of the American Red Cross. She was also introduced to Henry Dunant's book A Memory of Solferino, which called for the formation of national societies to provide relief voluntarily on a neutral basis. When Barton returned to the United States, she inaugurated a movement to gain recognition for the International Committee of the Red Cross by the United States government. In 1873, she began work on this project. In 1878, she met with President Rutherford B. Hayes, who expressed the opinion of most Americans at that time which was the U.S. would never again face a calamity like the Civil War. Barton finally succeeded during the administration of President Chester Arthur, using the argument that the new American Red Cross could respond to crises other than war such as natural disasters like earthquakes, forest fires, and hurricanes. Barton became President of the American branch of the society, which held its first official meeting at her I Street apartment in Washington, DC, May 21, 1881. The first local society was founded August 22, 1882 in Dansville, Livingston County, New York, where she maintained a country home. The society's role changed with the advent of the Spanish–American War during which it aided refugees and prisoners of the civil war. Domestically in 1884 she helped in the floods on the Ohio river, provided Texas with food and supplies during the famine of 1887 and took workers to Illinois in 1888 after a tornado and that same year to Florida for the yellow fever epidemic. Within days after the Johnstown Flood in 1889, she led her delegation of 50 doctors and nurses in response. In 1897, responding to the humanitarian crisis in the Ottoman Empire in the aftermath of the Hamidian Massacres, Barton sailed to Constantinople and after long negotiations with Abdul Hamid II, opened the first American International Red Cross headquarters in the heart of Turkey. Barton herself traveled along with five other Red Cross expeditions to the Armenian provinces in the spring of 1896, providing relief and humanitarian aid. Barton also worked in hospitals in Cuba in 1898 at the age of seventy-seven. Barton's last field operation as President of the American Red Cross was helping victims of the Galveston hurricane in 1900. The operation established an orphanage for children. As criticism arose of her mixing professional and personal resources, Barton was forced to resign as president of the American Red Cross in 1904, at the age of 83. She had been forced out of office by a new generation of all-male scientific experts who reflected the realistic efficiency of the Progressive Era rather than her idealistic humanitarianism. After resigning, Barton founded the National First Aid Society. 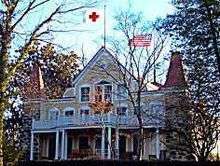 She continued to live in her Glen Echo, Maryland home which also served as the Red Cross Headquarters upon her arrival to the house in 1897. Barton published her autobiography in 1907, titled The Story of My Childhood. On April 12, 1912 at the age of 90 she died in her home. The cause of death was tuberculosis. Although not formally a member of the Universalist Church of America, in a 1905 letter to the widow of Carl Norman Thrasher, she identified herself with her parents' church as a "Universalist". While she was not an active member of her parents' church, Clara wrote about how well known her family was in her hometown and how many relationships her father formed with others in their town through their church and religion. In 1975, the Clara Barton National Historic Site, located at 5801 Oxford Road, Glen Echo, Maryland, was established as a unit of the National Park Service at Barton's home, where she spent the last 15 years of her life. 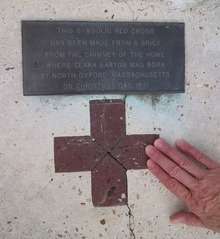 As the first National Historic Sites dedicated to the accomplishments of a woman, it preserves the early history of the American Red Cross, since the home also served as an early headquarters of the organization. The North Oxford, Massachusetts, house in which she was born is now also a museum. The National Park Service has restored eleven rooms, including the Red Cross offices, the parlors and Barton's bedroom. Visitors to Clara Barton National Historic Site can gain a sense of how Barton lived and worked. Guides lead tourists through the three levels, emphasizing Barton's use of her unusual home. Modern visitors can come to appreciate the site in the same way visitors did in Clara Barton's lifetime. In 1869, Clara Barton closed the Missing Soldiers Office and headed to Europe. The third floor of her old boardinghouse was boarded up in 1913, and the site forgotten. The site was "lost" in part because the city realigned its addressing system in the 1870s. The boardinghouse became 437 ½ Seventh Street Northwest (formerly 488-1/2 Seventh Street West). In 1997, General Services Administration carpenter Richard Lyons was hired to clear out the building for its demolition. He found a treasure trove of Clara Barton items in the attic, including signs, clothing, Civil War soldier's socks, an army tent, Civil War-era newspapers, and many documents relating to the Office of Missing Soldiers. This discovery led to the NPS saving the building from demolition. It took years, however, for the site to be restored. The Clara Barton's Missing Soldiers Office Museum, run by the National Museum of Civil War Medicine, opened in 2015. Numbering All the Bones by Ann Rinaldi features Clara Barton and Andersonville Prison, a Civil War prison with terrible conditions. Angel of Mercy (MGM, 1939) is a biographical short film directed by Edward L. Cahn, starring Sara Haden as Clara Barton and Ann Rutherford as a woman whose brother's death in a Civil War battle inspires her to join Barton in her work. In the NBC TV series Voyagers! (1982-1983), Phineas Bogg and Jeffrey Jones travel through time to make sure history proceeds correctly. In the episode "The Travels of Marco... and Friends", season 1, episode 9, original airdate December 3, 1982, Phineas and Jeffrey rescue Clara Barton (Patricia Donahue) from a burning wagon, but she is on the verge of succumbing to smoke inhalation. Jeffrey (a young boy from 1982) applies mouth-to-mouth resuscitation (a technique unknown in Barton's time) and saves her life, thus enabling her to go on to found the American Red Cross. ↑ Pryor, Elizabeth Brown (1988). Clara Barton: professional angel (1st pbk. print. ed.). Philadelphia: University of Pennsylvania. ISBN 9780812212730. ↑ Spiegel, Allen D. "The Role of Gender, Phrenology, Discrimination and Nervous Prostration in Clara Barton's Career". Journal of Community Health 20.6 (1995): 501-526. ↑ Oates, Stephen B. (1994). A Woman of Valor. Macmillan. pp. 13, 51–52. ISBN 0-02-923405-0. ↑ Oates, Stephen B. (1994). A Woman of Valor. Macmillan. pp. 58–64, 67–77, 83–91, 106–120. ISBN 0-02-923405-0. ↑ Oates, Stephen B. (1994). A Woman of Valor. Macmillan. pp. 145–146, 148–157. ISBN 0-02-923405-0. 1 2 "The Story of My Childhood". World Digital Library. 1907. Retrieved 2013-10-09. 1 2 Harper, Ida H. "The Life and Work of Clara Barton". The North American Review 195.678 (1912): 701-712. ↑ "Clara Barton Missing Soldiers Office". National Museum of Civil War Medicine. Retrieved 30 June 2014. ↑ "Clara Barton and Andersonville". National Park Service. Retrieved 2016-01-30. ↑ Peck, Garrett (2015). Walt Whitman in Washington, D.C.: The Civil War and America's Great Poet. Charleston, SC: The History Press. pp. 76–79. ISBN 978-1626199736. ↑ One or more of the preceding sentences incorporates text from a publication now in the public domain: Wilson, James Grant; Fiske, John, eds. (1900). "Barton, Clara". Appletons' Cyclopædia of American Biography. New York: D. Appleton. ↑ Epler, Percy Harold (1915). The Life of Clara Barton. Macmillan. Retrieved 2010-09-28. ↑ Marks, Mary Jo. "History - Founder Clara Barton". American Red Cross. Retrieved 2014-05-21. ↑ McCullough, David (1968). The Johnstown Flood. New York: Simon & Schuster. p. 239. ISBN 978-0-671-39530-8. 1 2 McCullough, David (1968). The Johnstown Flood. New York: Simon & Schuster. ISBN 978-0-671-39530-8. ↑ Christine Ardalan, "Clara Barton's 1898 battles in Cuba: a reexamination of her nursing contributions." Florida Atlantic Comparative Studies Journal 12.1 (2010). ↑ "Positive Atheism website". Archived from the original on 5 March 2016. Retrieved 2007-05-25. Source taken from The Universalist Leader 120/49 1938. My dear friend and sister: Your belief that I am a Universalist is as correct as your greater belief that you are one yourself, a belief in which all who are privileged to possess it rejoice. In my case, it was a great gift, like St. Paul, I 'was born free', and saved the pain of reaching it through years of struggle and doubt. My father was a leader in the building of the church in which Hosea Ballow preached his first dedication sermon. Your historic records will show that the old Huguenot town of Oxford, Mass. erected one of, if not the first Universalist Church in America. In this town I was born; in this church I was reared. In all its reconstructions and remodelings I have taken a part, and I look anxiously for a time in the near future when the busy world will let me once more become a living part of its people, praising God for the advance in the liberal faith of the religions of the world today, so largely due to the teachings of this belief. Give, I pray you, dear sister, my warmest congratulations to the members of your society. My best wishes for the success of your annual meeting, and accept my thanks most sincerely for having written me. Fraternally yours, (Signed) Clara Barton. ↑ "Clara Barton NHS – The House". National Park Service. Retrieved 2007-05-25. ↑ "Clara Barton Chronology 1861-1869". National Park Service. Retrieved 8 June 2015. ↑ "Clara Barton's Missing Soldiers Office: An Historic Rediscovery on 7th Street". Smithsonian Associates. July 2014. Retrieved September 23, 2015. ↑ "Clara Barton's D.C. Office To Be Civil War Missing Soldiers Museum". Huffington Post. April 12, 2012. Retrieved 23 September 2015. ↑ "Clara Barton Missing Soldiers Office". National Museum of Civil War Medicine. Retrieved 23 September 2015. ↑ Peck, Garrett (2015). Walt Whitman in Washington, D.C.: The Civil War and America's Great Poet. Charleston, SC: The History Press. pp. 76–80. ISBN 978-1626199736. ↑ "Clara Barton School No. 2 / Overview". rcsdk12.org. ↑ Michael. "Bartons Crossing Emergency (BCAC)". homelessshelterdirectory.org. ↑ "Trail Map of Big Trees Trail". Retrieved 22 December 2015. Crompton, Samuel Etinde. Clara Barton: Humanitarian. New York: Chelsea House, 2009. ISBN 9781604134926. OCLC 290489234. Deady, Kathleen W. Clara Barton. Mankato: Capstone Press, 2003. ISBN 0-736-81604-6. OCLC 50022907. Hutchinson, John F. Champions of Charity: War and the Rise of the Red Cross. Boulder: Westview Press, Inc., 1996. ISBN 0-813-32526-9 OCLC 33948775. Pryor, Elizabeth Brown. Clara Barton: Professional Angel. Philadelphia: University of Pennsylvania Press, 1987. ISBN 0-812-28060-1 OCLC 15792319.